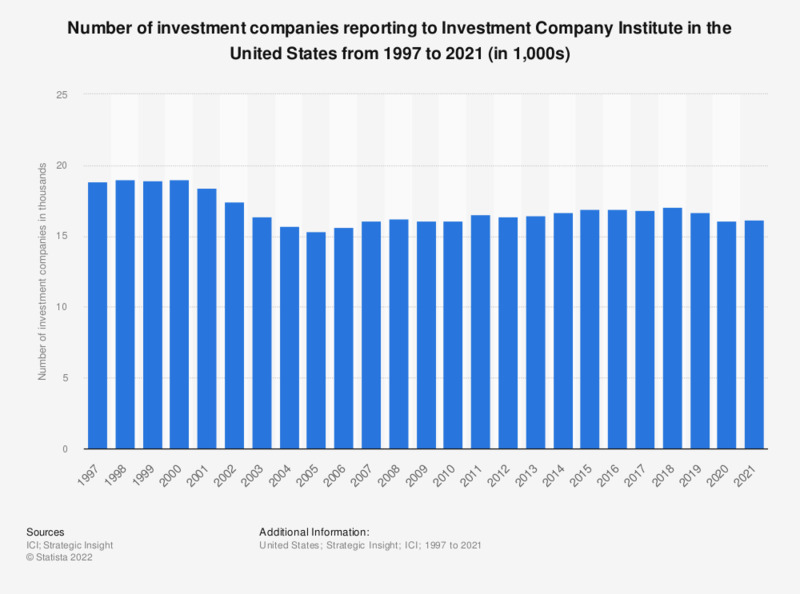 This statistic presents the number of investment companies reporting to Investment Company Institute in the United States from 1997 to 2017. There were 16,820 investment companies reporting to ICI in 2017. Data are for investment companies that report statistical information to the Investment Company Institute. Assets of these companies are 98 percent of investor assets. Investment companies include mutual funds (including funds investing primarily in other mutual funds), closed-end funds, exchange-traded funds and unit investment trusts. Exchange-traded funds data prior to 2001 were provided by Strategic Insight Simfund. ETF data includes investment companies not registered under the Investment Company Act of 1940 and ETFs that invest primarily in other ETFs.